The Hamburger | An Invention you can Eat! An Invention you can Eat! Welcome to Perfection on a Bun! The hamburger is a marvel of American food innovation. 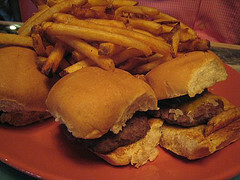 This sandwich, with the simple ingredients of a ground beef patty, bun or bread and condiments unique to the chef’s whim or the individual’s will, has captured the heart of millions, continually being among the favorite foods of many Americans. Its allure lies in its simplicity and differentiation, giving the eater comfort in its familiarity and excitement in its different condiments and toppings. The hamburger is one of few foods that serve to unify an ethnically divided country and become an icon of that nation’s industry around the world; That sandwich, the hamburger, could also ruin it as well. This unifying characteristics can be seen in its place in American popular culture, international trade and influence and the application of American entreprenuership and management skills to create a meal for the everyman: hearty, quick and inexpensive. The far reaching negative impacts of the sandwich can be seen through the negative health effects, such as links to heart disease and obesity, now being studied and the environmental impacts of a large meat processing industry to accommodate the hamburger driven fast food industry. Even still, for better or worse, the hamburger is seen internationally as an American food with iconic American brands, such as McDonald’s, exchanging this creation with the rest of the world.